Christopher E. “Chris” Stiles, age 33 of Sauk Centre, passed away unexpectedly on Saturday, January 12, 2019 in Sauk Centre, Minnesota from injuries sustained in a car accident. A funeral service will be held at 11 a.m. Tuesday, January 22 at the Patton-Schad Funeral Home in Sauk Centre. Interment and full military honors will be at Minnesota State Veterans Cemetery in Little Falls following the service. Visitation will be from 4 to 8 p.m. Monday and from 10 to 11 a.m. Tuesday at the funeral home in Sauk Centre. Christopher Edward Stiles was born October 15, 1985 in Fridley, Minnesota to Mark and Karen (Miller) Stiles. He graduated from Anoka STEP in 2004. 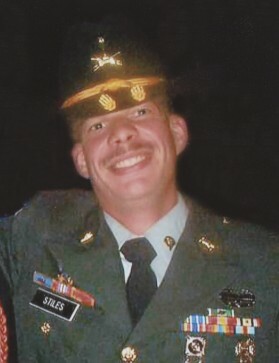 Chris came from a military family and carried on that legacy serving in the U.S. Army from 2005 to 2014. He served an 18-month tour in both Iraq and Afghanistan. After the military, he lived and worked at the Eagle’s Healing Nest in Sauk Centre. Chris enjoyed playing video games, listening to music, and most of all, taking care of and helping his fellow vets. Chris (the Stickman, Comic Relief, Moral Officer, and Wildchild) Stiles came to be part of our Eagle’s Healing Nest Family early 2013. His smile and one-liners created much laughter. He could be stubborn as heck which would result in a size 9 as he would say. He shared so much with us over the years - love, laughter, kindness, and yes even some trouble and he would say “Ma you know how I am” as he giggled and gave you that ever so memorable smirk smile. Stiles was a leader, he could lead the way to complete a mission or mischief. He never gave up on himself or his brothers or sisters in arms. Chris loved being a tanker and his time in service. Chris was an American Hero not only on the battlefield, he also saved many comrades through mentoring, sharing and caring, and Never Leaving Anyone Behind. Chris also was a Hero in death as he chose to be an organ donor to give the gift of life to others. Again, showing selfless service to others before self. Chris was and is loved by many, will be missed by many, many of us were blessed by having him as family…We will celebrate you and your life and remember you…Soaring on the Wings of an Eagle as you traveled the Stairway to Heaven. Survivors include his mother, Karen (Ron) Olsen of Conrad, Montana; brother, William (Alexis) Stiles of Aitkin and their children, Abigail, Logan, and Sawyer Stiles; brothers, William Olsen of Cottage Grove, Cody Olsen of Sandstone, Elijah Olsen of Askov; sisters, Lena Olsen of Conrad, Montana, and Tia Olsen of Conrad, Montana; and many aunts, uncles, cousins, and friends. Chris was preceded in death by his father, Mark Stiles; and grandparents.